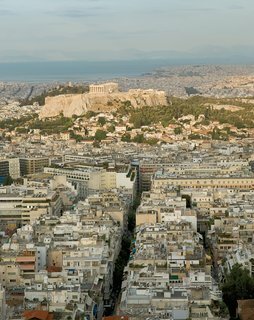 Athens is home to one of history’s most important buildings, the Parthenon, but how does the city fare architecturally today? 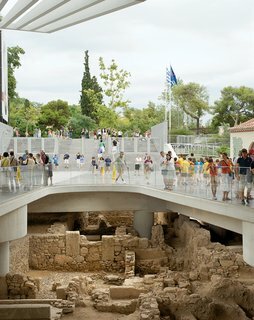 A spate of modern development, particularly a new museum that looks onto the Acropolis, suggests that things are looking up. One of Greece’s greatest modern architects—–whose work seems to be perpetually under attack—–is Takis Zenetos. 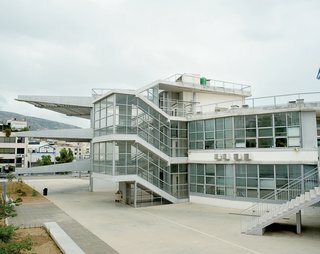 His Circular School from 1969, in the Agios Dimitrios neighborhood, is still in use. Another gleaming gem of contemporary design is the city’s subway system. The station at Agios Dimitrios is the terminal for the Red Line. Despite being a repository for some of the greatest built treasures in the world, Athens presents something of an architectural challenge. Unregulated growth of the city has led to a plethora of cookie-cutter housing developments and next to no green space. Small lots mean limited potential for large-scale landmark projects, and in the rampant development of the first part of the 20th century, scads of grand old villas fell to the developer’s wrecking ball. And yet the Greek capital has its gems, beginning with, of course, the pinnacle of classical design, the 2,400-year-old Parthenon by Iktinos and Kallikrates. Skip ahead a few millennia and you’ll find that local talent, like mid-century architect Takis Zenetos, has left an architectural legacy that—–perplexingly—–the city has occasionally seemed intent on destroying. Amongst the most famous of Athens’s mid-century facades is Bauhaus master Walter Gropius’s chancery for the American embassy. In 1957, Time magazine opined that the glassy, open structure "strik[es] a balance between monumentality and friendliness." A half century after Time’s glowing review, a rocket-propelled terrorist attack on the embassy birthed a security-over-design approach that still rankles some. Santiago Calatrava’s Katehaki pedestrian bridge and the Athens Olympic Sports Complex for the 2004 summer games are recent architectural high points, proof that Athens still does retain an appetite for contemporary design. The most pressing Athenian problem at the moment, though, isn’t arch-itectural: It’s a roiling currency and a flagging economy. Just a few years after the pre-Olympic boom, the building industry has ground to a crawl, though the slowdown hit just after one of the more inspiring additions to the city’s skyline took shape. The New Acropolis Museum, designed by New York’s Bernard Tschumi with local Greek architect Michael Photiadis, opened in 2009. Situated as it is in the shadow of the Parthenon, the New Acropolis Museum could have been a thoughtless imitation. Photiadis and Tschumi carried it off nicely, however, designing and executing a clean glass box that manages the great mathematical purity of the ancient Greeks and a fair bit of architectural deference without bowing to warmed-over classicism. This is unsurprising considering Photiadis’s track record as one of Greece’s most vibrant and varied architects. For that reason we asked him to help us navigate shaky, shifting, history-minded Athens. 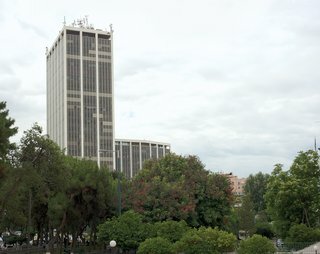 The Athens Tower by Ioannis Vikelas is one of the city’s modernist icons. Greece has undergone a massive fiscal convulsion. How has the design community been affected? Things have not been as dramatic as expected, but of course there is less work being asked of architects. Architects and designers are always some of the first to be hit by a low financial horizon. Certain things I was commissioned to do—–well, people got their permits but then said they wouldn’t start until things got better. 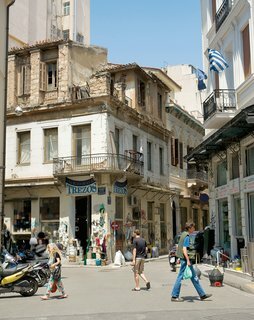 Traditional facades and considerable foot traffic are the norm in neighborhoods like Monastiraki. Santiago Calatrava designed a few buildings to coincide with the 2004 Summer Olympic Games. How have they held up?Calatrava’s stadium is a graceful and timeless design. By contrast, the Bird’s Nest stadium by Herzog + de Meuron for the Beijing Olympics is already dated. It’s a finicky, one-idea thing. Calatrava’s pedestrian bridge at the exit to the Katehaki metro station is a miss, though. It’s in a confusing traffic area and people don’t use it because it’s faster to just cross the street.In a city obsessed with antiquity, what are the best examples of modernism?Mid-century architect Takis Zenetos was forward-thinking with an almost sci-fi imagination. Most of his very exciting private homes have been demolished, but his clear thinking can still be seen in the Circular School and the Fix brewery, which was maimed by the needs of the metro but will be recycled as the long-awaited National Museum of Contemporary Art. I also like Ioannis Vikelas’s elegant skyscraper, the Athens Tower. Another building I always enjoy is the freestanding, early-1960s OLP [Piraeus Port Authority] office block in Piraeus, with the stunning catenary roof by [Yannis] Liapis and [Elias] Skroumbelos. Alpha Bank’s central headquarters, by Nikos Valsamakis, completed in the 1990s, forms a dignified urban arcade.You don’t like Gropius’s U.S. embassy building?You don’t see the building anymore; they have created a bunker. Security problems have erased the once-eloquent embassy. It’s cruel to the Americans and Greeks who work there, those who need consular services, and finally to Athenians. The New Acropolis Museum hovers over a working archeological site, a fitting metaphor for Athens, where antiquity still enjoys an outsize presence today. What is the city’s greatest design challenge?It was ancient Greece and then this huge gap until a couple hundred years ago. Athens was a small, likable city until the 1920s, when, unprepared, it received the first of three fierce blows. The first was in 1922, when the collapse of Smyrna [in Turkey] on the eastern front brought thousands of immigrants to the city [who found inte-grating difficult]. The second came after World War II and the cruel civil war that followed. Then came the antiparohi system, where the owner of a piece of land could turn over his property to an ergolavos, a contractor. The ergolavos would put up the money for the construction of an apartment block and agree with the owner to give him a certain percentage of the apartments. This led to the brutal destruction of many old private houses. Unfortunately, it was too late when thinking Athenians realized that barriers had to be put in to save the city’s heritage. Another problem is transportation. 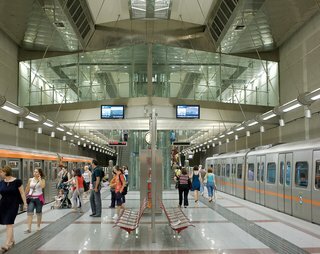 We’re still waiting for a master plan.Young as it is, hasn’t the Athens Metro helped things?Its absolute cleanliness—–both the vehicles and the astonishingly airy and light-filled stations—–makes for half the experience. In the beginning, I had a rather nasty feeling about the whole thing. The government had given away a very interesting design project to a German company, and we knew nothing about the stations. They’d be functional, but would they have any personality? Anyhow, it turned out to be beautifully done. The OLP office block by Liapis and Skroumbelos is a fine example of Greek brutalism. Also beautifully done is the New Acropolis Museum that Bernard Tschumi designed and for which you acted as his local counterpart during the competition and the early phases of the project. What were the biggest challenges?The site itself actually presented far more difficulty than any aesthetic program. For one, it’s right next to the Acropolis, so that is dangerous aesthetically no matter what. 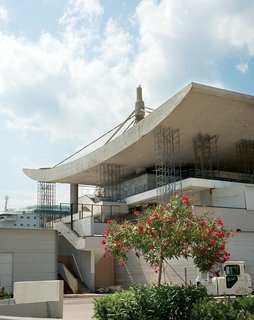 Another is the fact that the New Acropolis Museum had to be built to withstand earthquakes of ten on the Richter scale. Ten is nonexistent: No one has lived through, or even measured, a magnitude-ten earthquake. Yet we had to do it. It meant various interesting, technically peculiar, and difficult-to-solve problems. Another goal was to shelter the Acropolis’s sculptures in a spacious, relevant way.Greeks are rapacious coffee drinkers. Where do you get one?I was never a person to sit around on coffee stools, ever. This, I always found to be practically incriminating for the person who sat there. Still, it’s a nice way to organize business appointments. Zonar’s is an obvious choice. Then there’s the Clemente VIII, a perennial meeting place for people involved in the arts.